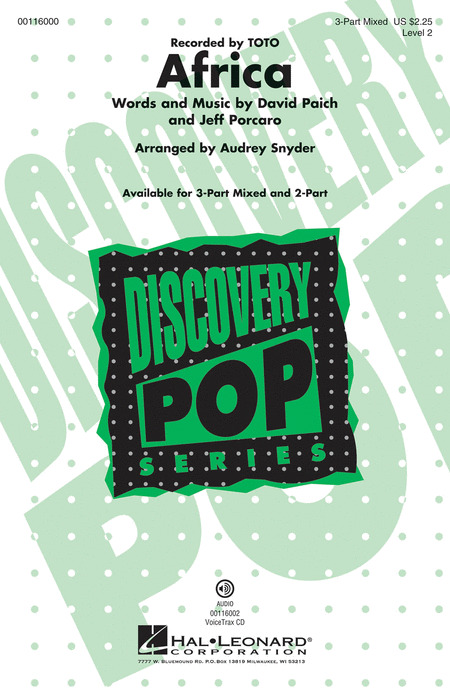 Audrey Snyder is a professional composer and arranger with several hundred choral titles currently in print and millions of copies sold, worldwide. Recipient of numerous ASCAP Awards, she is widely recognized as one of the top educational choral writers today. Her original choral compositions and arrangements span the entire spectrum of choral music, from Medieval and Renaissance transcriptions to current pop, from music for children's and middle school choruses to full concert choir, jazz and pop groups. Her published works include choral arrangements of music from movies such as The Lion King and Prince of Egypt, Broadway shows such as Wicked and Phantom of the Opera, and of pop artists and groups such as The Beatles, Elton John, and Josh Groban. Her original choral music is in huge demand and often reflects a rare beauty, simplicity and charm. She has appeared internationally as clinician and choral educator, and at ACDA, MENC and music dealer sponsored workshops for many years. Looking for a fast way to introduce music history? Try this tongue-in-cheek history lesson arranged by Audrey Snyder. Sure to entertain. 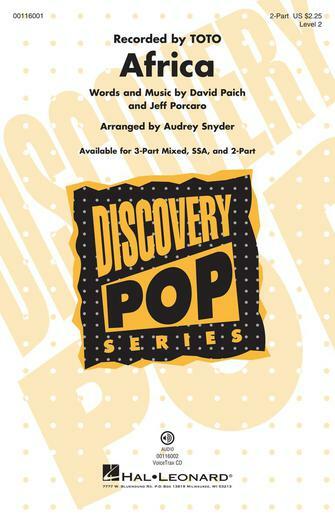 Available separately: SATB, 2-Part any combination and ShowTrax CD. Performance Time: Approx. 4:00. Widely recognized as one of the top educational choral writers today, Audrey composes music with rare beauty, simplicity and charm. She is a highly regarded educator, clinician, editor and producer. Thebuoyant a cappella SSA work "Welcome The New Day" is ideal for contest and other spring performances. Well-crafted part writing makes this an accessible choice for developing ensembles. The joyful new work "A New Day" is an excellent contest and concert piece. Well-crafted part writing makes this a fine choice for developing tuning, phrasing and choral style. Displaying 1-50 of 533 items. This adventure with Mary Poppins gets off to a suitably magical and delightful start with this bubbly bath-time number. Choirs will have a blast with the tongue-in-cheek text and exhilarating music! Now available for SATB choirs, changing the world starts with just one person! Using a powerful vocal call and response with body percussion, this original work builds confidence and self-awareness through the affirming lyrics and vocal inflections. Opt. a cappella. From the iconic musical Damn Yankees here is a song about success and what it takes to have it--heart and hope. A feel good song for any concert. Elena of Avalor is the story of a young Latina princess who is thrust upon the throne of her family's kingdom after her parents, the King and Queen, are killed. Disney values like thoughtfulness, resilience and compassion come to define Elena as she looks to her mentors for guidance. This song draws upon the Latin American tradition of Parranda Navideña, in which a group of friends surprise an unsuspecting individual with holiday song, instrument-playing, and refreshment! Based on a folk song from Ghana, additional melodies and harmonies are added to make this a stylish, swing anthem. This is a happy song of welcome and will make a wonderful, upbeat opener to your concert. From the Broadway musical The Pajama Game this is a production number to top all production numbers. With original choreography by Bob Fosse, your show choir will love creating the dance sequence. From the Saint-Saens Christmas Oratorio here is a wonderful masterwork skillfully arranged for younger, developing voices. A clear phonetic pronunciation guide is included making the Latin accessible. A voicetrax recording and optional string parts make this a concert centerpiece. This joyful new a cappella work is an excellent contest and concert piece. Well-crafted part writing makes this a fine choice for developing tuning, phrasing and choral style. This accessible Discovery edition of Toto's #1 hit from 1983 provides many options for education and creativity and spans the generations in its appeal! As plentiful as the grass that grows, the sands on the shore, the dew in the meadow, or the wind across the moor...so shall grace and blessings be. This beautiful Irish blessing text is creatively set in an expressive a cappella original work by Audrey Snyder. Excellent programming for treble choirs of all ages! Words of comfort and healing from Revelation 21:4 form the textual framework for this richly expressive a cappella setting. Ideal for a benediction, Remembrance or Memorial Day performance, this work offers many rewards. Diuration: ca. 2:30. A unique concert selection based upon the poetry of William Blake. Juxtaposing the mystical nature of dreams with the vastness of the star filled nighttime sky Audrey Snyder creates a shimmering ethereal effect through the use of water glass accompaniment that can be performed by the singers. Arranged to work equally well with piano accompaniment or as an a cappella selection, here is a fresh, pop style take on this traditional carol. Your singers will shine in this carefully crafted arrangement. 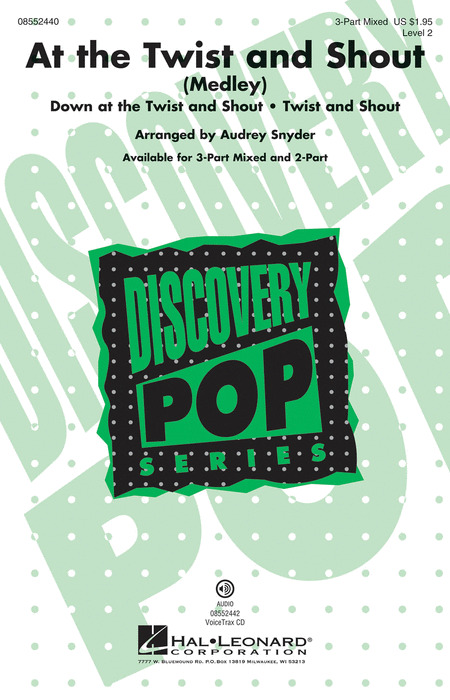 Two pop tunes from totally different eras combine into a non-stop party in this arrangement for younger choirs! Down at the Twist and Shout has a Louisiana style Cajun groove and with snippets of Twist and Shout added for a colorful choral mash-up! Available separately: 3-Part Mixed, 2-Part, VoiceTrax CD. Duration: ca. 2:30.